Find our tasty olives at festivals, or buy them online. 6 years ago, we had a dream to sell olives from our VW camper van at music festivals. We set off in our little VW with some olives, our 2 children plus a bump on an adventure...and what a journey it's been! 2000 - We buy olive! 2011 - We try selling olives from olive. Testing the Olive in a Bus Concept at our first small festival in Wales. This was on our daughters due date, and olives engine self destructed on the way home. Kirsteen cried. A lot. An Artist at Glastonbury painted this brilliant watercolour. 2013 - We get into V festival! Our first big event opposite the 4 Music stage at V Festival. A great view but not many olive-eaters! 2015 - Gin and Olives! We try selling gin and olives - and it works! Our brand "Olive in a Bus" is now recognised by festival goers at Glastonbury, V Festival, Wilderness, Womad, Boardmasters and many more, and our story has been used by Volkswagen in a short video called "Olives on Tour" https://youtube/bVE2b8Z0zAc to advertise their latest California camper van. We have just released our latest product - lovely big olives infused in NB Gin. 2000 - 2011 - We eat olives in olive. 2011 - We think, wouldn't it be a great idea to sell olives from olive? 2012 - We try selling olives from olive, in the wettest summer for 100 years at loads of small festivals...it works and we love it! 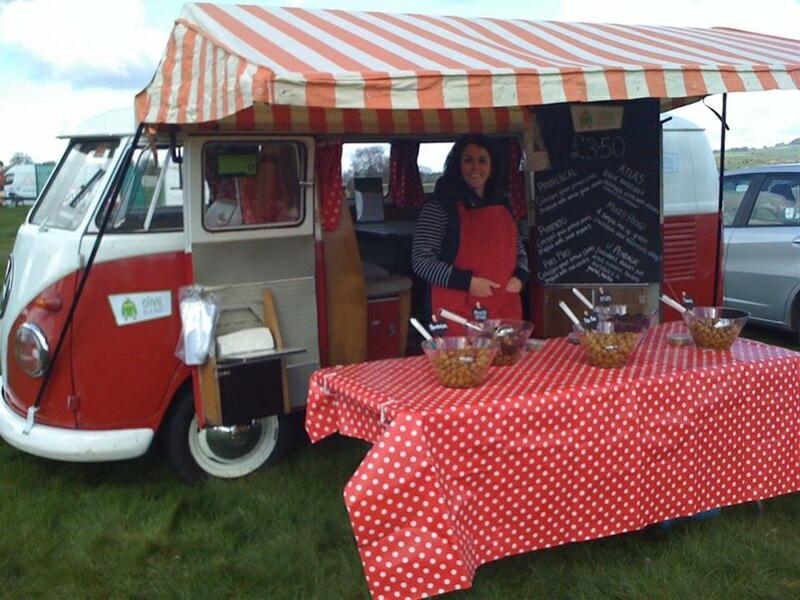 2013 - Our tiny olive van gets a pitch at its first big event - V Festival! 2014 - Our tiny olive van gets a pitch at Glastonbury, and loads of other cool festivals; we drink lots of gin. We think, wouldn't it be a great idea to sell olives AND gin from olive? 2015 - We try selling gin AND olives from olive...and it works. We think, wouldn't it be great idea to sell olives WITH gin. 2016 - We find a great company called alco-olives who are doing just that. We sell their product at all the big festivals - our customers love them! 2017 - We love alco-olives so much...we buy the company and now you can buy our range of handmade alcohol infused olives at festivals, Amazon, online and at local stockists. 2018 - We are now producing the Olives in the Cotswolds and continuing to grow our online sales.